Chamorro rice cakes, or Potu, are rice cakes that are made by soaking grains of rice in tuba, or a sweet fermented coconut sap. The soaked rice is then ground and sweetened then steamed into a light and fluffy cake. Living in the mainland U.S., I’ve had to learn to make substitutions for those ingredients not commonly found or sold here. A key ingredient for potu as I mentioned above is tuba. Since coconut trees don’t grow where I live, I’ve had to figure out a substitute for this potent potable. I use a combination of palm or coconut vinegar and coconut water when I make my potu. I also use non-glutinous rice flour for ease in preparation. I’ll post my easy-peasy shortcut potu recipe soon, but until then, this post features my good friend, Rose Camacho’s recipe. Rose doesn’t use rice flour when she makes her potu. Instead, she soaks grains of jasmine rice then grinds it. She also uses palm vinegar in her recipe. Rose’s recipe is “tried and true” and loved by many. Hmmm? How does one describe these pure white puff pillows of steamed ground rice? Light, soft, sweet, and sticky! Growing up, this has been many a childhood’s favorite. Although the ingredients are simple, this recipe is pretty prized amongst the native Chamorro women and no one would share theirs. It was a guarded secret recipe, and some have literally taken it to their grave!! In my quest to find a GOOD recipe, because it is one of my husband’s favorite desserts, I’ve tweaked and wasted, and tweaked and wasted countless ingredients trying to perfect this recipe. I remember my sister-in-law, Mona and I, and mind you, she’s an EXCELLENT cook, I remember us mixing, beating, steaming and without any close results, have failed trying to perfect it. I gave up! I just prayed that a passer by relative who’s flying in, stops and delivers some of these cakes, made all the way from the islands, to us. I’d freeze them, steam them as we needed, and then one day our stash of sweet rice potu was G-O-N-E, gone! Because the rice kernels HAVE TO soak, you need to start the night before you’re planning on serving it. The brand of rice I use is pictured below. If you decide to use another brand or type of rice, I will not be held responsible if you fail with this recipe. I’ve only used this brand whenever I make my recipe. The palm vinegar I used is also pictured below. I’m sure other brands can be used. I’ve also tried using coconut vinegar and it works fine. Measure out 1 cup of the dry rice. Wash the rice in water until the water runs clear! Drain well. Place into a container, add the 1 cup of water and cover. Set this aside and allow to soak for a minimum of 8 hours but preferably overnight. When you’re ready to prepare the recipe, start heating up the water in your steamer. In the container that your rice is in, there may still be some water left from the soaking. DO NOT drain this water. Place the rice into a heavy duty blender container (I use my Vitamix Professional 750) for this process since it’s pretty heavy duty. Add the sugar and palm vinegar to the rice and water. NOTE: If you do not have a heavy duty mixer, you may have to do this step in smaller increments. Just process the rice in batches, rather than one whole time. Although, I’ve never done it this way, if you have a heavy duty food processor, such as a KitchenAid, I’m sure you could also use that. The key is to grind the rice FINE! Process this in your blender, until the rice kernels are finely ground. Shut the blender off and add the baking powder. Now process again for a minute or 2 being careful that the mixture doesn’t heat up. While the mixture is still processing, line up your silicon cups in the steamer basket. For easier handling, pour the batter into a smaller container and pour 3/4 of the way into each baking cup. This mixture makes about 12 potu cakes OR more if you use smaller silicon cups. Place the steamer basket into the steamer pot, which should already be producing heavy steam. Place a CLEAN kitchen towel over the top of the steamer basket to catch any condensation that will occur during the steaming process. Place the lid onto the pot. The lid will also hold the towel taught so that it doesn’t fall onto the potu. Steam this for a minimum of 20 minutes and up to 30 minutes, depending on the heat that’s produced. After about 20 minutes, CAREFULLY lift the lid and towel away, to see how the process is going. I get excited when I see that little “crack” in the center of my potu. It tells me it’s gonna be PERFECT! When done, the potu should spring back a bit, with a slight stickiness to the tops. Remove from the steamer pot and allow them to cool before removing them from the basket. Set them aside to cool completely before removing them from the silicon cups. SERVE! Place the leftovers in a plastic bag to keep them fresh. 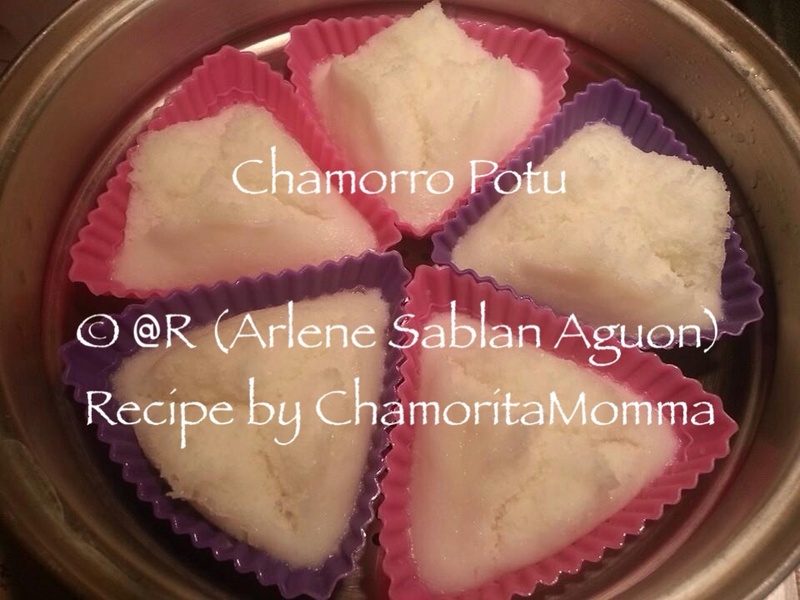 Thank you, Rose Camacho (aka Chamorita Momma) for allowing me to repost and share your Tried and True Potu recipe! I’m working on fixing that. Come back soon; it should be fixed in a few days. Hi there, What is the brand rice do you use? Any brand of jasmine rice will work with this recipe. Could I use Rice Vinegar instead of Palm Vinegar? Just made this for my husband who has been off island for 5 years, and he loves it! I Can use of Apple cider vinegar instead of Palm vinegar? Apple cider vinegar has a distinct flavor. I would use plain distilled white vinegar instead. Try decreasing the amount of liquid. Annie do you have the Rice Flour recipe by any chance? I am not sure what you mean by “rice flour recipe.” Are you asking me how to make rice flour, or do you need a recipe using rice flour? What if I dont have a steamer? If you do an Internet search for “how to steam without a steamer” you’ll get several options on how to do it. I just made this Potu recipe and it is exactly how I remember it growing up. Yes it is stickier but this is how I remember my Auntie Mame’s Potu. And she was the best Potu maker I know of. In fact the only one I knew growing up. Follow this recipe exactly as the directions say to and you will have people thinking you had it shipped from home. The Palm vinegar comes really really close to the taste of tuba. I have tried a LOT of recipes and they are all great but this recipe is how I remember Potu. A huge Si Yuus Maase to Rose for sharing and to you Annie for posting it here. Oh and the jerk chicken recipe is amazing. I only allow myself to make it bi weekly. It is addicting!! Thanks again for sharing. Annie I meant your “crack chicken” recipe. I just said to my husband I think I will make Annie’s jerk chicken since I was thinking /writing about it and he says I thought it was crack chicken. Lol. Thanks again!! Gemma, start out low then gradually increase the setting to higher levels, up to about 5 or 6. Don’t blend it too long so that the liquid heats up, but do blend it long enough so that all of the rice pulverizes and becomes a smooth liquid. I waaaant to make this now. My Potu also comes out dense and sticky. I use the Healthmaster blender but I am not sure if I’m blending it too long or not enough. I have attempted it twice. My dad gave me the thumbs up for taste but said I need to figure out how to make it less dense and sticky. Any suggestions as to speed and length of time when using the blender. By the way, I so love your website. Elaine, there could be a couple of rsasons your potu didn’t turn out fluffy. Did you use the rice called for in the recipe (namely, the one shown in the photo)? If you used medium or short grain rice, you will need to decrease the amount of liquid, by half probably. I, for one, hate wasting ingredients, but if you want to give this recipe another try, use my suggested fixes and let me know if it turns out better. Thanks for the quick response. I used the same rice that was pictured in the tutorial. I soaked the rice overnight and only used the water that was with the soaked rice. So, I’m still puzzled. I will give it many more attempts because the recipe is so simple but I am open to any other suggestions. I hope it turns out better next time. I’m not familiar with the type of blender you have. I have a Vitamix and it blends the rice mixture incredibly smooth. You want to ensure you blend it long enough to create a batter-like consistency. Another thought…ensure you place a clean cloth beneath the steamer lid so that the condensation doesn’t drip onto the potu as it steams. Success! I used the Healthmaster blender and Nutribullet to test whether it might have been my blender, but it was not. I also drained the water into a bowl from the soaked rice and grinded the rice to powder, then added the water back. I reduced the water to 3/4 cup and increased the baking powder to 3 tsps. Just wanted to share in case someone runs into the problem of dense batter. Thanks for sharing your results!! I’m sure it will be very helpful to others. Question Annie, can you use the tuba that has been sitting in the refrigerator for a while instead of the palm vinegar? It has started to turn a little sour from sitting. Frances, the tuba is most likely already fermenting and turning into vinegar. It might be fine to use it, although use just a little bit and dilute with water as if you were using palm vinegar. First of all, thanks for sharing the recipes. I like how you explain things. I did have a question for the Potu. I’ve just spent two hours trying to make it with ground rice. The taste is spot on however I can’t get the texture right. It comes out really dense instead of light and the tops still come out wet and sticky. What does the batter texture suppose to be like? Pancake batter or thinner? Thanks! Hi Maggie. The batter is supposed to be smooth, not grainy. Perhaps you need to blend the mixture a bit longer. This is my friend, Rose’s recipe. She uses a Vitamix blender to grind the rice. That’s a pretty heavy duty mixer; if you don’t have a heavy duty mixer/blender that can grind the rice super smooth, try using a food processor. The only other thing I can think of is to soak the rice longer, overnight even. Would cream of rice work in this recipe. Unfortunately, cream of rice will not work. You can use rice flour instead, but be sure to use non-glutinous rice flour. Hi, do you have a recipe of puto made from millet? If you do, please share. Hello! No, I’m sorry, but I don’t have a recipe for puto made from millet. If I find one, I’ll post the link to it here. Thanks for stopping by! Hello ,I love all the recipes do you have to use the silicone baking cps for the potu? No, you don’t need to use silicone baking cups at all. You can use aluminum baking tins (the disposable kind) as well. Just cut the disposable pan into a size that will fit into your steamer. I also recommend lining the tins with paper cupcake liners to make it easier to remove as well as easy clean up. You can also use mini oven-safe glass bowls or mini pie tins. Small ramekins work too.